Kara’s struggle will resonate with a lot of young mothers who never expected postpartum depression to happen to them. She didn’t start getting better until she decided to take control and put effort into her treatment, finally finding something that worked for her. 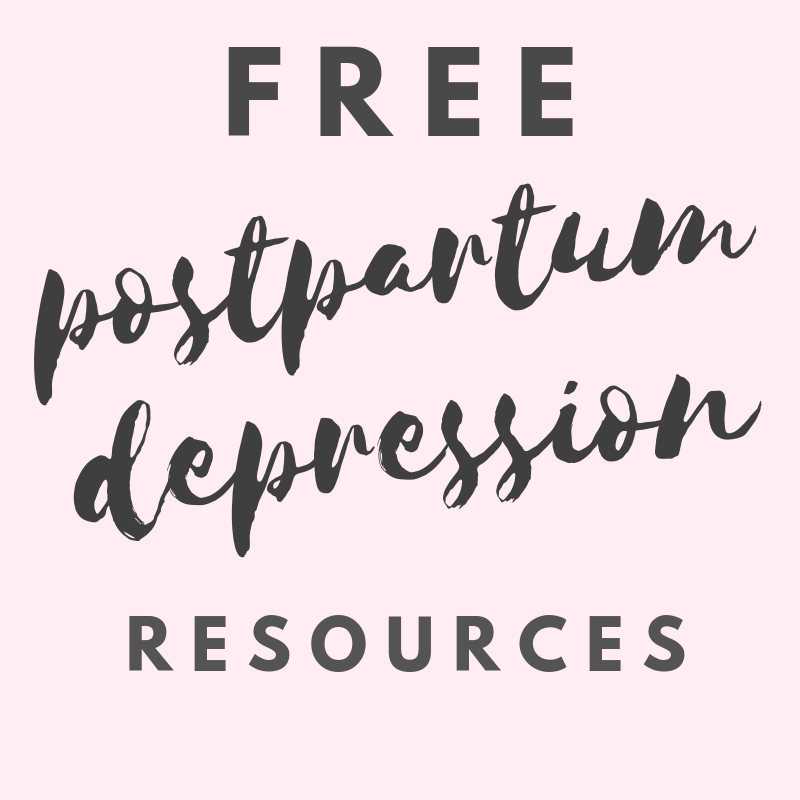 Accepting and acknowledging postpartum depression is the first step on a long road to recovery. *This post may contain affiliate links* *This is a guest post and all opinions are those of the author and not necessarily those of www.runningintriangles.com. Due to the nature of the topic, this post may contain graphic details that some may find disturbing. My story of postpartum depression started in a quiet hospital room, early on a Thursday afternoon in May. I was twenty years old and had just finished my last final of the semester the morning before. It was 2:24 pm when they handed her soft, tiny body up to me. I had barely felt the labor, and I barely felt anything as she rested on my chest. I remember thinking that I should be crying, like all the beautiful women captured in the first moments of motherhood by birth photographers. I didn’t have one those. I just had my husband to one side, my mother to the other, and my 17-year-old sister hiding behind her iPad since attending the birth was just barely better than a day stuck in school. It’s not to say that I didn’t love her then. I mean, she pooped all over my hand and I didn’t even care. If you knew me, you’d understand how big of a deal that is. I loved her, but I was young. I was still trying to fathom the gravity of what just happened. As all my friends were gearing up for a summer of secret night-drinking and lazy river-beach days, I was learning how to breast feed and budgeting diapers out of our paychecks. They had their lives in front of them, and I had my daughter’s in front of me. The PPD was something that snuck up. I didn’t have a history of mental illness, and that fact made it very difficult to recognize the symptoms. The first time I talked to a doctor was when she was six months old. I had what I thought was a panic attack during our road-trip to see my husband’s family in Montana. I was given an anti-anxiety med to take as I needed. I think I only ever took three pills from that bottle. Later, I’d find out that what I experienced then, was nothing compared to what I’d let myself go through in the future. As life moved on and my beautiful little girl grew, so much of my life crashed down around me. I’m a perfectionist by nature, which I fully believe was one of the biggest contributing factors. I felt I needed to be super-human, super-mom, super-student, super-everything. At one point, I maintained a 4.0 in college as an English major, worked three part-time jobs, did all the cooking and cleaning, and raised my daughter. But, my credit score was plummeting as I charged my over-expensive organic grocery bills and filled my closet with clothes just because getting a package in the mail gave me a joyous rush. My weight jumped up and down as I’d binge for a few weeks, then starve myself for others. My marriage started to crumble, as my husband didn’t understand why I was so upset all the time and was preoccupied with the recent death of his mother. I even told him I didn’t love him anymore. I realized later that it wasn’t that I didn’t love him, but that I didn’t feel anything anymore. I went to the doctor on and off. I went to a counselor on and off. I took different medications. I tried different forms of birth control. Nothing changed. I’d have high-functioning anxiety during the semester and crash into depression during every break. It got to the point where I held a knife blade to my wrists after one grueling week of work, and bills, and papers due. I pressed lightly as tears streamed down my face, chest heaving. It was the lowest I had ever felt. It was about 3:45 in the afternoon. I had to pick up my daughter from daycare at 4. It was the only thing that made me fold the knife back, and set it on the table. I held her extra close that night. I knew I needed to do something to help myself. If not for me at that point, then for her. I went to a new doctor and was given another brand of medication. I also started to put effort into researching different options. I didn’t want to be on a daily medication forever, so I started a yoga practice and promised myself I would get outside to walk more. I didn’t feel much of a change until we went on another road trip the following summer— this time to the Oregon coast and through Montana on our way home. We hiked every day, by the ocean, through tall pine forests, and to waterfalls hidden in the mountains. I was exhausted the end of every day, but I felt happy. It was a genuine happiness that I hadn’t felt in years. I knew I had found my saving grace. The mountains, rivers, plains, and trees. They were what I needed. Each step I took on those days brought me closer to the point of healing. While I will never assume what worked for me will work for everyone, nor that getting outside is all that is needed to heal a major depressive disorder, I know it can help. And I think it can help everyone. Bathing in the glory of nature can help start the healing processes. I’m 24 now. In September, I gave birth to my second daughter. I’m still young, but this labor, I felt everything—every moment, every pain, every burn. I cried as she laid her head on my chest, with her dark eyes looking up at me. I have every second since I decided to put that knife down to thank for that quiet, beautiful moment with her. I can’t say that PPD won’t recur this time around, but never again will I let it try to take my life. My girls, my husband, and I have too many trails left to see.